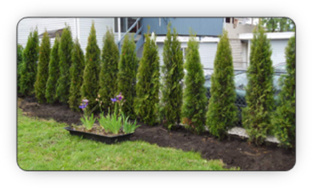 Shaped hedge cedars – Our most popular privacy hedge solution – The difference between our shaped cedars and our field cedars (below), is that as our designated shaped cedars grow, we trim, prune, groom and shape them – to give them a beautiful, full, bushy, uniform, conical shape. What this means is – once planted, they'll fill in and give you a true privacy hedge much, much faster than our traditional field cedars, so you won't be waiting as long for the privacy you were after to begin with. 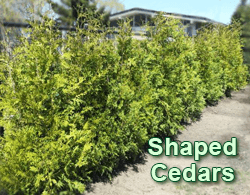 Your striking shaped cedar hedge is sure to be the envy of your neighborhood. Field hedge cedars – the 'field' in field hedge cedars means they grow naturally (or wild) on our farm – and because they have to compete with other plant life, they tend to grow taller & thinner than our shaped hedge cedars… in other words, they don't have the same chance to fill-out and become as full and bushy as our shaped varieties do . We don't groom, prune or shape them, either – but at only $2.75 for each vertical foot of height (depending on the height of the cedars you choose)… the price is right. While Pyramid cedars have a natural conical shape, and tend to be relatively low maintenance, they’re intended as decorative trees, and so, won’t fill-in fully the way our shaped or field cedars do. They’re typically planted with good spacing between them, so they won’t interfere with each other… making them nice to look at, but not as effective as shaped or field cedars at creating privacy. Once we're done, all you’ll have to do is keep them adequately watered & fed, have them pruned periodically… and of course, enjoy watching them grow!